A perfect city break for anyone wanting to visit Poland and its capital! 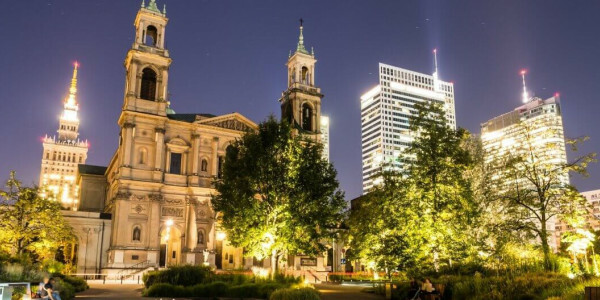 Experience the throbbing vibe of the city as you go on two tours: one shows you Warsaw through the ages and the other gets you familiar with the history of Jews in the Warsaw ghetto. You also receive two-way airport transfers and a hotel that you choose! Keep reading to find out more about the tours, transfers and hotel you are booking! Tour Jewish Warsaw in a complete package with two-way airport transfer and a hotel! This 3-hour walking tour of Jewish Warsaw includes 12 of the most important sites to Jews in Warsaw. Learn the unbelievable stories of life and heros in the Jewish ghetto in Warsaw, see monuments that commemorate people who had the courage to fight against the German occupation, and discover the truth behind the Warsaw ghetto uprising. When the Nazi soldiers marched into Poland on 1 September 1939, no one could predict how difficult life would become. Hitler was persistent - his aim was to exterminate all Jewish people. His hate has led to the establishment of the Jewish ghetto in Warsaw, where Jews were squeezed into small flats living in fear. Dragged into the Umschlagplatz, Jews were selected either for a quick death on the square or for a long and painful one in the infamous concentration camps. The Taste of Warsaw Package will let you see life in the capital as a local - with tours, door-to-door airport transfers, 24-hour emergency line support, a low-price guarantee, and personally verified hotel! Please consider that you’ll drive classic car without air conditioning and, in some of the cars, no seatbelts, due to their age. ON ARRIVAL: Our driver will be waiting for you at the arrival gate, holding a signboard with your name. ABOUT TRANSFER: This will be tranfer from Warsaw Chopin Airport to any given address within Warsaw city borders. The transfer to the centre of Warsaw will take around 30 minutes. ABOUT AIRPORT: Okecie Airport (WAW) is the main Warsaw airport located about 10 miles away from the city. Most flights to Warsaw arrive at this Airport. Vienna House Easy Chopin Cracow is a charming 3-star hotel conveniently located near the centre of Krakow. Guests of the hotel will have easy access to Botanic Garden, Central Train Station and Juliusz Slowacki Theater. Krakow Barbican, Florian's Gate and Czartoryski Museum are also not far away.